Shivaranjini is one of three daughters. Her handicapped father can rarely find work and her mother – a maison helper – does not earn enough to send their girls to college. 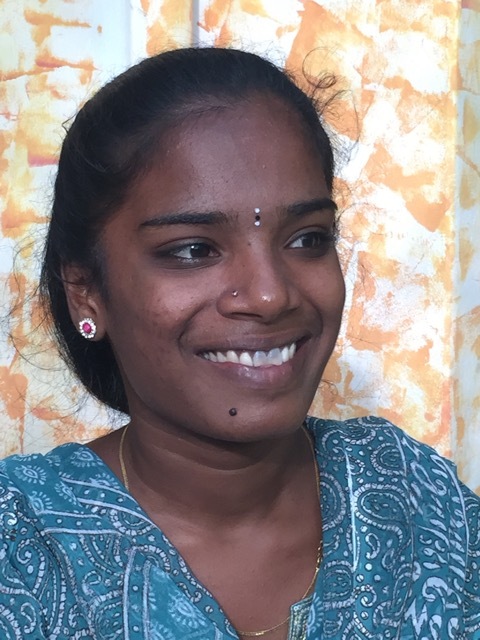 Shivaranjini is the oldest, she likes Physics and she is good at it. Since last summer she studies Bachelor of Science in Physics at the nearby Idayha college. She is doing well and although a little shy in the beginning now opens up. She will have good chances to get a job with this degree. She attends our weekly English classes regularly, smiles her big smile and is really happy she is part of Reach for the Stars now. Sie macht sich gut, auch wenn sie am Anfang etwas schüchtern war, öffnet sie sich langsam. Sie nimmt regelmäßig an unserem Englischunterricht und anderen Programmen teil. Sie lächelt strahlend und ist glücklich, ein Teil von Reach for the Stars zu sein.